Aspirancy is an opportunity for men who are interested in a Capuchin vocation to live with us for a period of time. During this program they seek the guidance of the Holy Spirit to help them discern if the Lord is calling them to enter postulancy. Postulancy is the first stage of formation as a Capuchin Franciscan Friar. It is a time of initial discernment. While living at St. Conrad Friary in Berkeley a postulant comes to know the Capuchins better by praying and working together in the friary and in a ministry, especially, with the poor. During the 10 month period a postulant learns more about his Catholic Faith, St. Francis of Assisi, the Capuchin Order and religious life and the province through classes and discussions with his director and other friars. Postulants may also attend some classes at a local college or hold a part-time job. A postulant is free to leave at any time. The novitiate is a structured year of prayer and some ministry in which the novice enters more deeply into the process of his discernment as a Capuchin Franciscan life. The novitiate year officially begins with Investiture, a ceremony in which he is clothed in the Capuchin Franciscan habit. The novice furthers his understanding of Capuchin life through classes on the Rule and Testament of St. Francis, Capuchin Constitutions, Capuchin History, Franciscan Sources, Franciscan Prayer, Writings of St. Francis and St. Clare, the vows of poverty, chastity and obedience. He meets regularly with his formator (Novice master) and spiritual director who guide him through his discernment as a Capuchin Friar. At the end of the year the novice professes temporary vows of poverty, chastity and obedience. These vows are renewed each year for three years (or four) before making final profession. After the novitiate year the newly professed friar returns to St. Conrad Friary, the Capuchin House of Studies, in Berkeley. His first year is devoted to a deepening of his novitiate experience of contemplation and ministry. During this time a friar also experiences fraternity and ministry in our communities in California and our mission in Northern Mexico. 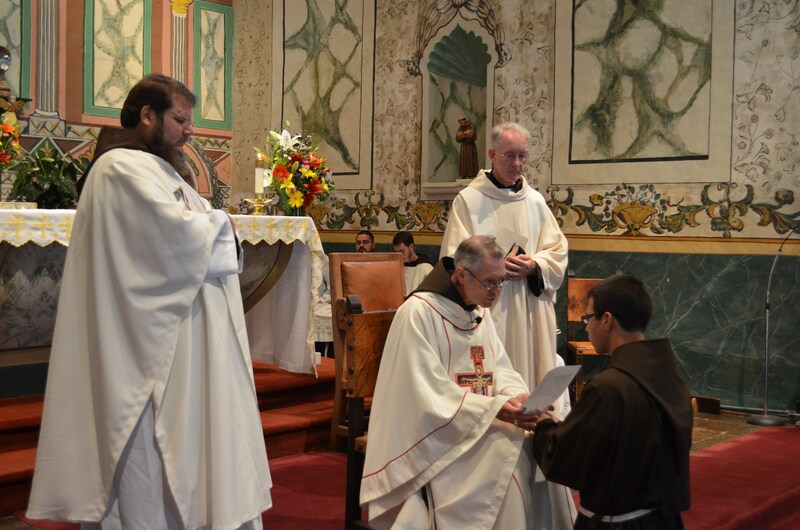 Depending on his program, a friar in the formation is involved in studies and ministry in preparation for Solemn Vows, his final commitment to God and the Capuchin Order. Those students who feel called to the priesthood attend the Dominican School of Philosophy and Theology in Berkeley, CA. Other programs are available such as religious studies, counseling, carpentry, etc., depending of the interest of the friar and the needs of the province.